Cheers To 75 Years Of Drinking Legally Unemployment rising. Banks disappearing. It may feel like 1929 all over again, but there's a crucial difference between the Great Depression and our tough times: We can legally drown our sorrows in alcohol. 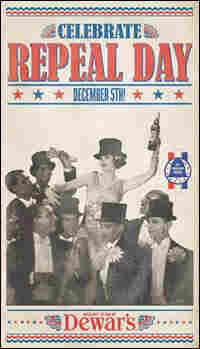 Today, the nation celebrates the 75th anniversary of the repeal of Prohibition. Unemployment is rising and banks are disappearing. It may feel like 1929 all over again, but there's a crucial difference between the Great Depression and our fiscal crisis: We modern folk can legally drown our sorrows in alcohol. It may not be much solace, but on Friday, Dec. 5, you can spend your few remaining dollars on a cocktail to toast the 75th anniversary of the repeal of Prohibition and the legalization of alcohol. Just past the stroke of midnight in Brooklyn, history-conscious revelers were already getting their drink on. At the Royale Bar, the bartender lined up shot glasses for the house and liberally poured the whiskey. "To the end of Prohibition!" shouted Trevor Bataglia to the cheers of his friends. And how does one properly observe Repeal Day? Bataglia explains that you think St. Patrick's Day, then take it one step further. Bars and alcohol companies would be happy to see another drunken holiday on the calendar. And why not the date when the 21st Amendment ending Prohibition was ratified back in 1933? Besides, Cinco de December has a nice ring to it. This year around the country, you can find drink specials and blowout parties with a Roaring '20s theme. Dewar's Scotch even bought full-page ads in New York to promote the day. Bartender and blogger Jeffrey Morgenthaler has been pushing the idea of a true drinking holiday for 10 years now, and he says this year it took off exponentially. But Morgenthaler says you really need to do it right by drinking American craft beers and cask-aged spirits. "Seek out your local microbrewed beer. Seek out your small American distilleries. Seek out your local wineries," he says. "It's important that we celebrate the day because it marks the return of those American traditions that were almost lost during Prohibition." 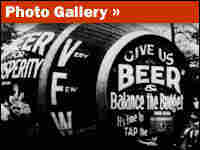 People are also encouraged to think about the legacy of Prohibition. Sociologist David Hanson has been studying the effects of that era 75 years later. He's an emeritus professor at the State University of New York, Potsdam. Prohibition, he says, changed habits and encouraged binge drinking. "People did not go to a speakeasy to have a leisurely drink over their meal. They went there to get drunk and to drink in a rebellious way." The swill they were drinking was often of such low quality that they developed the sugary, syrupy cocktails that remain popular in America. Yet somehow the era retains its illicit romance. In New York City, there has been a trend to open fake speakeasies. Little hidden bars with no signs and a password at the door. The lounge PDT (Please Don't Tell) can be entered only through an unmarked telephone booth in the corner of a hot dog joint in the East Village of Manhattan. You go inside the booth, pick up the phone, and the back wall opens to reveal a cozy windowless bar and a stuffed bear head roaring back at you. Jim Meehan is the manager and mixologist who comes up with the rare and seasonal cocktails on the short menu. He says New Yorkers love the idea of secret places that only they know about, but he doesn't romanticize the Prohibition era. His cocktails are a reminder of the days before Prohibition when people, he says, would still savor a drink. PDT is not planning a big blowout party for Repeal Day. In fact, for Meehan the anniversary has, dare we say it, a sobering message. "We can never take our rights for granted," he says.